The Platypus Affiliated Society is a talk shop that holds discussions and movie showings on two elite Chicago campuses, as well as blogging ad nauseam in cyberspace about “reformulating the Marxian Left.” Beneath the “Marxian” verbiage, the Platypus group’s political purpose is defense of U.S. imperialist “democracy,” as exhibited in particular by Platypus leader Chris Cutrone’s support for the invasion and occupation of Iraq! This argument echoes the neocons. Nonetheless, we felt compelled to respond to this pretentious clot because they have been using our materials on their reading lists. As an act of political sanitation, the Chicago Spartacus Youth Club produced the leaflet that we reprint below to expose these academic apologists for U.S. imperialism for who they are. Buyer beware! Copies of our leaflet were snapped up by people attending a 6 November 2007 Platypus panel discussion, “The 3 Rs: Reform, Revolution, and ‘Resistance’: The Problematic Forms of ‘Anticapitalism’ Today.” In his closing remarks, Cutrone insinuated that the left was ashamed of its history. Our comrade responded that we are proud of our history. We stand in the tradition of the Bolshevik Party that led the Russian Revolution. In contrast, both Platypus and the new Students for a Democratic Society (SDS—represented on the panel by Marisa Holmes) seek to refurbish the image of racist U.S. imperialism. SDS does this through appeals to the capitalist Democratic Party. Our leaflet and interventions struck a nerve with Cutrone, who sent us an e-mail two days later whining that “I have never in any form suggested, let alone said, because I do not believe that the U.S. invasion and occupation of Iraq was good and supportable, but only questioned the alternatives” (our emphasis). There’s a distinction without a difference—the alternative that Cutrone has “questioned” (repeatedly) is an end to the U.S. occupation! Workers Vanguard has already replied to two letters in which Cutrone argues that the blood-drenched U.S. imperialists are playing a progressive role in Iraq (see “An Exchange on the Iraq ‘Resistance’,” WV No. 847, 29 April 2005 and “Exchange on Iraq Occupation,” WV No. 874, 4 August 2006). The SYCs call for the immediate and unconditional withdrawal of all U.S. troops from Iraq and Afghanistan. In doing so, we stand in the tradition of V.I. Lenin, who wrote in 1915: “Any socialist would wish the oppressed, dependent and unequal states victory against the oppressor, slave-holding and predatory ‘Great’ Powers” (Socialism and War). Our leaflet of 6 November 2007 was reissued November 12 and has been distributed at the University of Chicago. Platypus imbibes the worst of all worlds: the worst of the reformist left, the worst of bourgeois academia, the worst of post-modernist claptrap. Centered at the University of Chicago and School of the Art Institute [SAIC], two bastions of class privilege and academic pretension, Platypus’s guru is one Chris Cutrone, an SAIC instructor and U of C grad student, who briefly passed through the Spartacus Youth Club in the 1990s. His Platypus outfit is of note to us mainly because its reading lists include a number of our Spartacist polemics on such topics as imperialism, the New Left and black nationalism. But Platypus guts our Trotskyist arguments of any revolutionary content, twisting them to fit their own reactionary anti-Marxist ends. So it is necessary to restate some basic Marxist principles and expose this campus talk shop’s pro-imperialist politics, in case anyone might be fooled into thinking they have anything, “theoretical” or otherwise, to offer inquiring radical minds. For Platypus, the fundamental social divide is not the class struggle of proletariat vs. bourgeoisie, but an amorphous and classless contest of “Left” vs. “Right.” And according to the Platypi, “the Left is dead.” Disdaining a proletarian perspective, Platypus argues that in the post-Soviet world the main forces opposing U.S. imperialism abroad come from the “Right,” i.e., Islamic reaction. They therefore uphold U.S. imperialist “democracy” against the Iraqi peoples as the “lesser” evil. As Cutrone said recently in one of his interminable Web posts: “I take no comfort whatsoever in the fact that the U.S. and the political process it is fostering is being ‘resisted’ in Iraq. In this sense, I would be happy to see the U.S. be ‘successful’ in Iraq (according to what it claims to be doing there)” (platypus1917 yahoo group [“pyg”], 13 September 2007). In a 2006 letter to Workers Vanguard, Cutrone alibied U.S. imperialism’s crimes in Iraq, writing: “The reality is that the US troops in Iraq stand between the Iraqi workers and Leftists and the insurgents and Iraqi-government affiliated paramilitaries” (“Exchange on Iraq Occupation,” WV No. 874, 4 August 2006). No! The racist and rapacious U.S. ruling class—in both its Democratic and Republican wings—is an enemy of the working people and the oppressed around the globe! War is the inevitable product of the capitalist competition for profits, resources and markets. Only socialist revolution can end war! Every blow struck against the imperialist occupiers is a blow in the interests of workers and the oppressed worldwide. 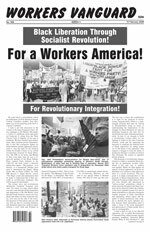 During the 2003 invasion, we uniquely took a side in defense of Iraq, calling for a class-struggle opposition to U.S. imperialism. Today we call for immediate, unconditional withdrawal of all U.S. troops from Iraq and Afghanistan. Insofar as the forces on the ground aim their fire against the occupiers and their lackeys, we call for their military defense against U.S. imperialism. At the same time, we are intransigent opponents of the Islamic fundamentalists’ and Ba’athist remnants’ murderous inter-communal violence, and warn that, absent working-class struggle against the occupation, the victory of one of these forces would likely come about through a bloody alliance with imperialism. In the face of the imperialists’ war provocations against Iran, Cutrone grotesquely argues that he cannot defend Iran because “the U.S. is more civilized” (pyg, 9 October 2006). U.S. imperialism more “civilized”?! Tell that to the victims incinerated at Hiroshima and Nagasaki, slaughtered in Vietnam, tortured at Abu Ghraib, or left to drown in the man-made racist atrocity in the face of Hurricane Katrina. Iran needs nuclear weapons to defend itself against the blood-drenched U.S. rulers. Imperialist hands off Iran! As part of his defense of Western bourgeois “democracy” and “civilization,” Cutrone also nauseatingly declares that “the Israeli state/govt.” should be defended “against what I think Hamas (and even Fatah, e.g., the al-Aqsa brigades) represent” (pyg, 15 June 2007). We say: Defend the Palestinian people! All Israeli troops, settlers out of the Occupied Territories! At bottom, the Israeli/Palestinian conflict is one of interpenetrated peoples, two populations laying claim to the same small piece of land, whose conflicting national claims cannot be resolved under capitalism. The liberation of the Palestinians demands a perspective of socialist revolution throughout the Near East. We defend Hamas and Fatah against the Zionist butchers, while giving them not one iota of political support. We also vigorously oppose acts of indiscriminate terror against innocent Israeli civilians, which only drive the Hebrew-speaking population toward its own ruling class. At home, from the vantage of the ivory tower, Cutrone disgustingly slanders courageous black militants like Malcolm X as “pathological” (pyg, 26 April 2007). The Platypi hate Malcolm X for the same reason that the racist capitalist rulers feared and hated him: he was an uncompromising fighter for black freedom. While lacking a Marxist understanding of the need to mobilize the multiracial working class independent of its capitalist masters, Malcolm X was a truth-teller who exposed the hypocrisy and lies of the capitalist Democratic and Republican parties and advocated the right of armed self-defense against Klan and police terror. Platypus instead promotes the liberal integrationist program of Martin Luther King and Bayard Rustin, which shackled the civil rights movement to the Democratic Party of racism and war based on the illusion that black equality can be won within the confines of capitalism. Understanding that black oppression is the bedrock of American capitalism, the SYCs fight for revolutionary integrationism. We seek to mobilize labor’s power to combat every instance of racist discrimination, such as the racist political frame-up of death row political prisoner Mumia Abu-Jamal and the Jim Crow “justice” meted out to the Jena Six. At the same time, we understand that black freedom will not be won short of socialist revolution. For black liberation through socialist revolution! The 1917 Russian Revolution is a litmus test, posing the question of proletarian dictatorship pointblank. The petty-bourgeois Cutrone sneers that “The Bolshevik Revolution was a disaster, almost from the beginning,” and became “less and less defensible over time, beginning at least as early as 1918” (pyg, 20 March 2007). 1918 notably was the year when the Bolsheviks expropriated the bourgeoisie, and imperialist troops invaded to smash the fledgling workers state. As Trotskyists, we hail the Bolshevik Revolution! Despite the Stalinist degeneration that began in 1923-24, we fought for the unconditional military defense of the Soviet Union against imperialist attack and counterrevolution. Cutrone also dismisses the Vietnamese workers and peasants’ battlefield defeat of U.S. imperialism as a “pyrrhic victory.” There was nothing “pyrrhic” about this great victory, which drove out the imperialists and overthrew the national bourgeoisie through a social revolution. This stinging defeat also produced the “Vietnam syndrome,” helping to stay U.S. imperialism’s hands militarily for over a decade. Today we defend the remaining deformed workers states—China, Vietnam, Cuba and North Korea—while calling for proletarian political revolution to oust the Stalinist bureaucracies. The Platypi’s outright support to the neocolonial occupation of Iraq may set them somewhat apart from other reformist leftists active at SAIC and U of C, such as the International Socialist Organization (ISO), Revolutionary Communist Party (RCP), Spark and Socialist Alternative (SAlt). Not that this stopped the ISO from rubbing shoulders in oh-so-comradely dialogue with Cutrone at Platypus’s January 30 “Imperialism” forum. At bottom, no less than Platypus, these other fake socialists stand for class collaboration with imperialism. They too are anti-Marxist opponents of the revolutionary workers movement. They enthusiastically backed the capitalist rulers’ anti-Soviet war drive in the 1980s, taking a side with the imperialist-backed Islamic reactionaries against the Red Army in Afghanistan, and then cheering the Yeltsin/Bush counterrevolution that overthrew the Soviet Union in 1991-92. None of these groups took a stand in defense of Iraq in 2003. Instead, the ISO, RCP, Spark and SAlt show their faith in the capitalist class enemy by trying to build an “antiwar movement” consisting of “peace-loving” people of all different classes to pressure the imperialist rulers to end the occupation and put resources into “jobs not war.” Their goal is simply to pressure the Democratic Party—the other party of racist U.S. imperialism—to put a more “humane” face on the capitalist profit system. In sharp contrast, the SYCs fight to dispel all illusions that capitalism can be reformed to serve the interests of the working people and the oppressed. We fight for socialist revolution under the leadership of a proletarian vanguard party like Lenin and Trotsky’s Bolsheviks. Youth interested in joining this fight should check out our revolutionary Trotskyist program and literature.